A new decade saw some big changes in the Irish political scene. Jack Lynch had resigned in 1979 and was replaced as Taoiseach and leader of Fianna Fáil by the controversial Charles Haughey. Liam Cosgrave had stepped down as Fine Gael leader after the party's 1977 defeat and had been replaced by the former Minister for External Affairs Dr. Garret FitzGerald, while Frank Cluskey succeeded Brendan Corish as Labour leader at the same time. Each party had big ideas for the coming decade, with the Fianna Fáil promising to make the 80s "the decade of endeavour". Fine Gael under FitzGerald experienced sweeping reforms which were intended to modernise the party and set it up as a credible and equal rival to Fianna Fáil. The election was expected to be called at the Fianna Fáil árd-fheis in February, but this was delayed by the Stardust nightclub tragedy. Instead, Haughey dissolved the Dáil on May 21st and put the election date three weeks ahead of it - the shortest amount of time legally permitted for an election campaign. Fianna Fáil campaigned heavily on their record, hoping to repeat their spectacular 1977 performance, while Fine Gael and Labour - without explicitly agreeing a deal - campaigned to return to government after four years in Opposition. Initially, Fianna Fáil had enjoyed a large amount of support from the public, but this had waned by the time campaigning got underway. Of concern to the party was the situation in Northern Ireland - Republican prisoners had begun hunger strikes in the H-block of the Maze Prison, eventually resulting in the deaths of ten prisoners. Supporters of the hunger strikers contested the election as the abstentionist Anti H-Block committee. These events undermined Fianna Fáil's republican credentials and affected its popularity, particularly in border counties. Meanwhile, Fine Gael were enjoying a boost from the personal popularity of Dr. FitzGerald, while Cluskey's Labour adopted a program that was closer to social democracy than the overt references to socialism in the 1970s. Despite the efforts of all three parties, the election itself proved inconclusive. Fianna Fáil lost 6 seats, 5.3% of the vote, and their majority. Some of their losses went to the Anti H-Block group, which saw 2 of its 9 candidates elected. 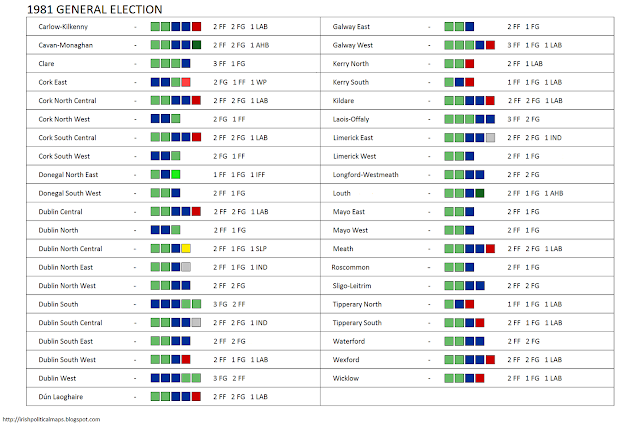 As Dáil Éireann had increased to 166 seats from 148, there were plenty of opportunities for the Opposition to make gains. Fine Gael also took from the Fianna Fáil vote and made impressive gains, winning 20 new seats and improving even on their 1973 numbers. The Labour Party's performance was uninspiring, with any gains being offset by losses. Cluskey himself lost his seat in Dublin South Central, and was replaced by Dublin Central's Michael O'Leary. Nonetheless, the two main Opposition parties together had won 80 seats, surpassing the outgoing government party. With the support of independent TD Jim Kemmy and the abstention of the republican TDs, Noel Browne (now elected for the Socialist Labour Party) and the newly elected Workers' Party TD Joe Sherlock, Garret FitzGerald was elected Taoiseach with a Fine Gael-Labour government. On the same day as his election, upon returning from Áras an Uachtaráin to accept his seal of office, the new Taoiseach announced that he had already learned "something of the scale of the damage done" to the Irish economy by the actions of the previous government. Rather than becoming the decade of endeavour, the 1980s looked set to be a decade of uncertainty. This election turned out to be the first of three within the 18 months, which turned that uncertainty to pessimism.